She just gave us so many new ideas for how to use a stability ball. With her first official video since 2015, Missy Elliott is back in epic form. 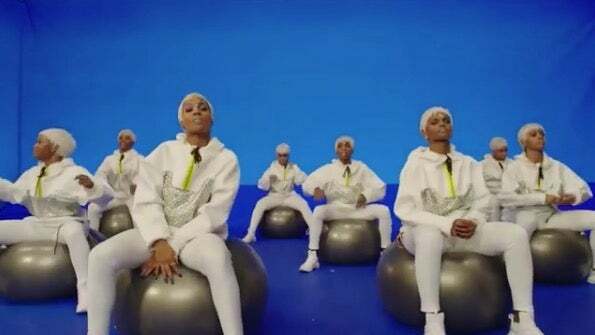 In the video for “I’m Better,” a catchy new jam featuring Lamb, Elliott rocks a different look in every scene (check out the reflective lipstick), and her dancers wear everything from neon-colored contacts to white pixie cuts and light-up helmets. But the best part is the crazy choreography, which features dancers hanging from the ceiling and falling into water—and an entire routine performed on exercise balls. Yesterday, Elliott posted a behind-the-scenes look at the stability ball routine on Instagram. The dancers bounce off the balls as they perform moves (including twirls and back bends) in unison—talk about core strength! Elliott points out in her caption that the dancers didn’t even know they were being filmed at the time (they thought they were just rehearsing) and the routine is still flawless. You can check out the final cut, in which the dancers appear underwater, below. Of course, you could also cue up “I’m Better” on your playlist and steal the dancers’ moves for your next gym sesh.